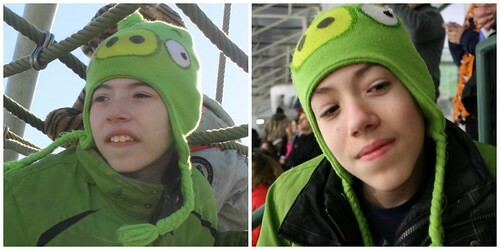 It strikes me suddenly that it has been a week—more even—since Jack's tournament and I have barely written about it. Well. That should change if only because anything that makes my kid smile like this needs to be written about. Although to be honest, that photo just reflects that he was smiling about a video Quinn had made about his nose, which resulted in Jack asking me to make a video about his nose, which led to this, which I share because I think my guy is just so goldarn cute. So, the UCT Winter Hockey Festival took place about 20 minutes from my house a little more than a week ago and it was GREAT. 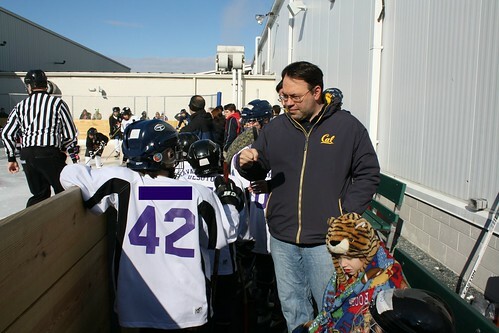 The Cheetahs had four teams playing in the tournament, which hosted more than a dozen teams from around the Northeast. Jack's first game was in the afternoon on Saturday, which was a lovely change from our normal Saturday morning routine, wherein we have to have Jack at the rink and all suited up for practice by 7:45 am. 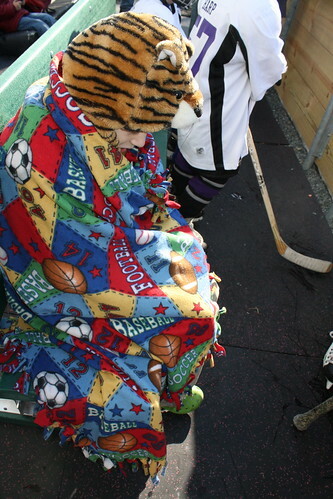 Team Stimey accidentally sat in the bleachers with the opposing team's families for that first game, which mostly only got awkward when some folks commented on the kid who was lying down on the ice in a big X shape. I think you know whose kid that was. Regardless, the game was fun, my friend/one of Jack's former teachers came to watch, and someone won. Or didn't. 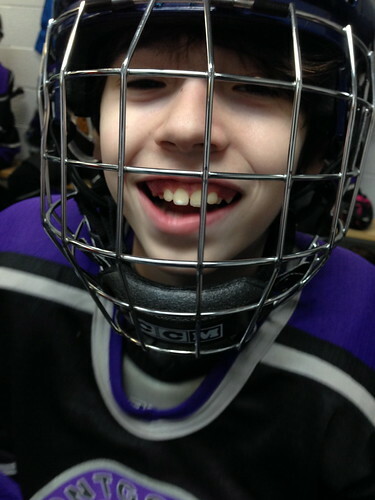 Honestly, at Jack's level of special hockey, sometimes it's hard to tell. Hey, we're all winners! Even if we lie down on the ice during the game. Even Quinn, who can barely handle the cold of rink-side benches, happily cavorted. We returned later that afternoon for the opening ceremonies at which each athlete got to walk across the ice and get a medal. 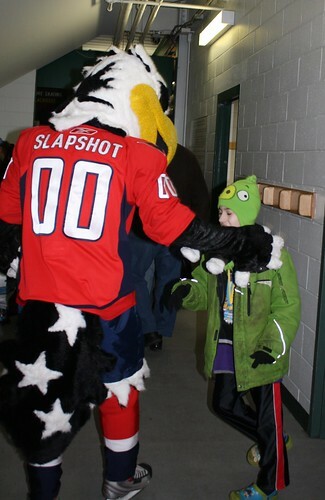 Jack killed time before he got his medal by hanging out with Slapshot, the Washington Capitals' mascot. Okay, maybe not just Jack. Sam killed time by pretending to be Jack. Jack on left. Sam on right, thinking he is hilarious. Quinn killed time by reading a Garfield book. I won't bore you with that photo. I’m kidding. We just ran after him to say hello in person. 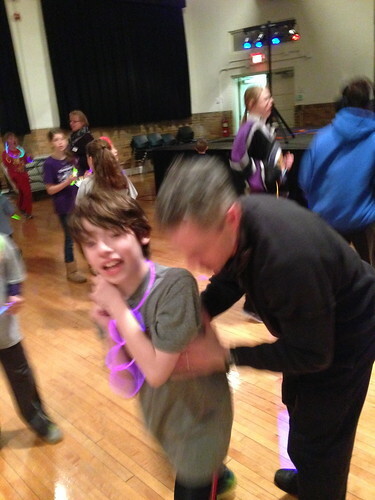 Now, the thing about hockey tournaments is that the games are great and the cheering is fun and the opening ceremony and the medals are a blast, but the real magic of special hockey comes in watching the players be with the other players and their coaches. They find common ground. They laugh. They joke. They spin. They play video games together. And if they are Montgomery Cheetahs at this particular tournament, they DANCE. The Cheetahs had a party after the ceremony for the athletes and their families. Let me tell you, it got raucous. I know it’s blurry. But it gets the point across. That is one of Jack’s coaches standing behind him. Shortly thereafter, Jack was up on his shoulders. The Cheetah Nation knows how to party. Watching all those players connecting with each other and finding their community among themselves? I can't even tell you how good that feels to watch. Also, if someone organizes all the kiddos into the front of the room and has them sing "We Are the Champions," well, that will feel pretty good too. Sadly, there is a harsh alarm after every excellent party and mine went off at the crack of dawn because Jack had an 8 am game on Sunday. We got to the rink on time and settled ourselves (on the correct cheering side) in the bleachers and then Alex demonstrated for all of you exactly how we all felt at that moment. Although to be fair, I’m not sure why we did all the complaining when Jack was the one who had to actually compete in an athletic event at that ungodly hour. 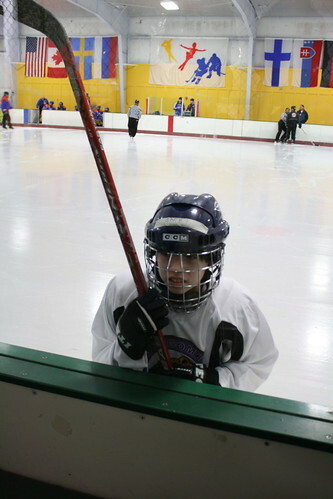 Soon enough though, Alex's face unscrunched as he watched Jack skate and play. 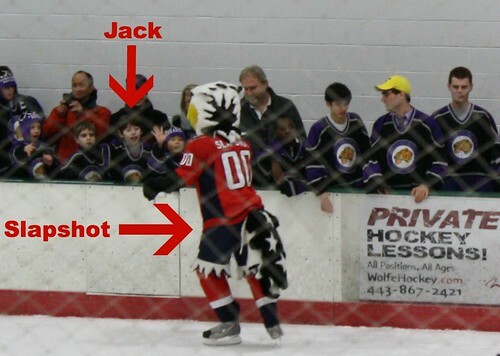 Then we watched Jack hit the puck between the goalie's legs and score a goal. A GOAL. Those aren't easy to come by for the more cheerfully lackadaisical players, of which Jack is one. You should have seen Alex's face. I was too busy smiling and clapping to take that photo. Then my longtime commenter/new friend Karen showed up to watch the game. She is a Stimeyland reader and, according to Wordpress, was my top commenter last year. It was wonderful to put her face to her words and even better to find out that she is a really lovely person. Big thanks to you, Karen, for putting yourself out there and coming by. It was an absolute joy to hang out with you. Jack and I didn't take all his gear off between games, because his next one was at 11 am, so he sat in the cafe and played on an iPad wearing everything but his helmet, gloves, and skates. Naturally, after wearing them for three hours, he determined right before his next game that THESE ELBOW PADS ARE ITCHY AND TERRIBLE AND I ABSOLUTELY CAN'T TAKE THEM ANOTHER MINUTE ELBOWS ARE OVERRATED ANYWAY!!! I managed to scratch his elbows until he was okay and he marched off to the outside rink, which was where his last game of the tournament was. Honestly, it didn't feel TOO cold out there. Although some people vehemently disagreed with that claim. 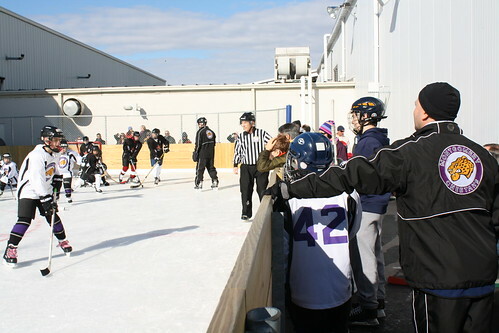 The outside rink is a very tiny rink, which made for some highly entertaining hockey, full of collisions and spills and lots of action. Plus, the players' bench was right in there with the spectators so we could cheer on and support our kiddos from close up. 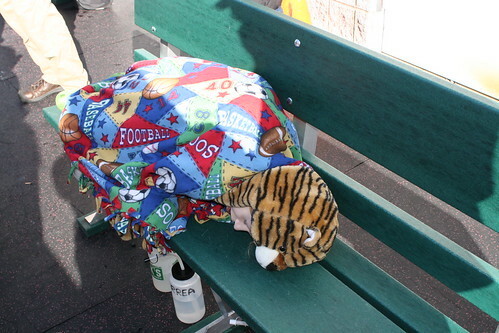 Tired as he was, Jack stayed motivated and played all of his shifts. This kid is so amazing. I couldn't be prouder of him. Now we just have to teach Jack to keep his stick on the ice so he can get more puck time. I'm also proud of Quinn for making it through the entire game, even if he did hog much of the players' bench in a profound expression of his freezing-cold misery. Alex DID offer to take him inside, but Quinn refused. After Jack's game, we headed home, which was a nice little aspect of not traveling for this tournament. (Also nice, running into my friend Andrea, whose son plays for another local special hockey team, but whom I NEVER see.) This tournament was really well put together and a lot of fun. Watching these teams play never ceases to make me extremely happy. The real question, however, isn't about whether the tournament makes me happy. It's about whether it makes Jack happy. 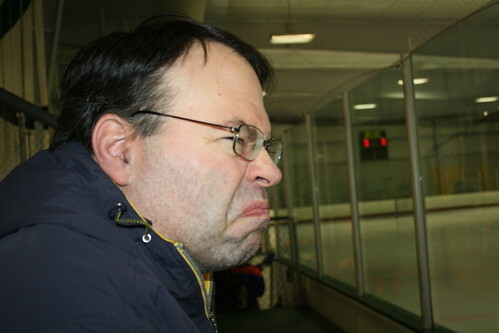 Sometimes he grumbles about going to practice and sometimes he gets grumpy out on the ice, but he loves his team too. 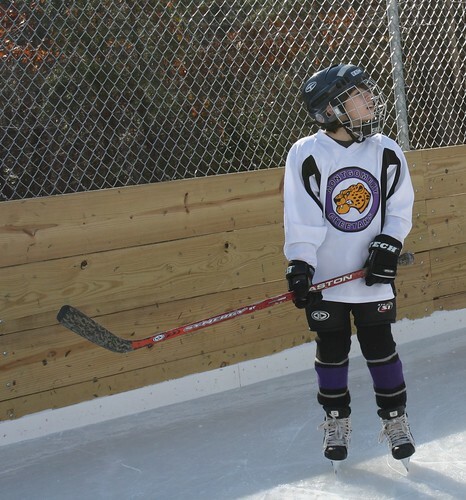 He is so proud to tell people that he plays hockey with the Montgomery Cheetahs. Anytime there is a "wear your favorite team's jersey" day at school, he wears HIS Cheetahs jersey. He is a Cheetah through and through, and we are so happy that he is. The best testament though, is that when I asked him just a few days after this tournament if he wanted to go to the travel tournament in New York again this year, he thought for maybe three seconds, popped his thumb in the air, and said, "Bingo!" OK - where to begin. This is so many levels of awesome. I love that you have found this community through hockey and that your son so obviously enjoys it. I love that you got to play outdoors (I'm pretty sure I skated on that rink as a kid once). But I do have ONE criticism. How could you let JACK switch from a BAUER helmet????? And I do have one question for you. Or for Jack. Did you get the puck? Yay Jack and the Cheetahs! The Cheetah team & coaches sound really awesome. And yay Team Stimey for hanging in there & cheering on the Cheetahs even though it was early & freezing. Yes, that smile. It makes me glow. I think that rink actually is a new one that just opened maybe this season. It was a lot of fun. Jack didn't get the puck, but he still treasures his puck that you sent him the first time he got one in the net! - I greatly enjoyed hanging out with you & [most of] Team Stimey, too! 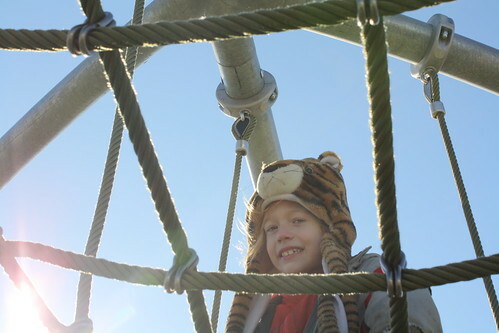 Have a great weekend, and enjoy the warm-ish weather. Hello this is Keegan again from the Sluis Academy. Great post! 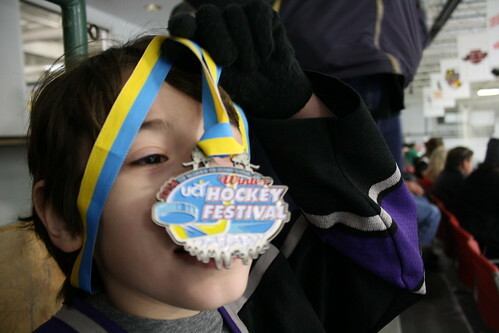 it is awesome that your son is into hockey. I cant tell you how many life lessons I learned from playing in team sports. Keep up the good work and make sure you build him up on his bad days because children can lose interest very easily. 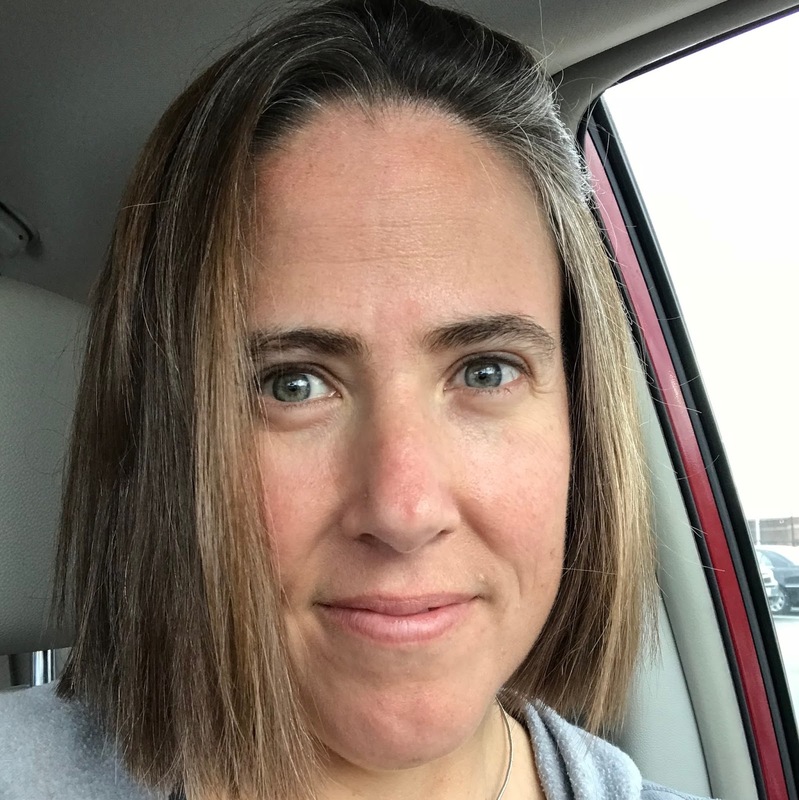 I just posted for this week. Maybe I'll post about personality types or something next. I got a whole week to consider that.